Equality in football, and a Leeds United Ladies invasion! 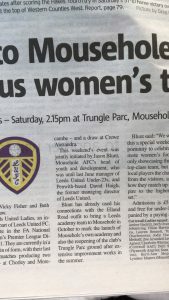 As Cornwall readies itself for a Leeds United Ladies invasion, myself and Sport Capital are extremely happy to have helped facilitate the visit and the fixture between Cornwall FA XI and Leeds United Ladies on Saturday February 24th (Trungle Park, Mousehole – 2:15pm), along with former Leeds United Under-23s manager, Jason Blunt. 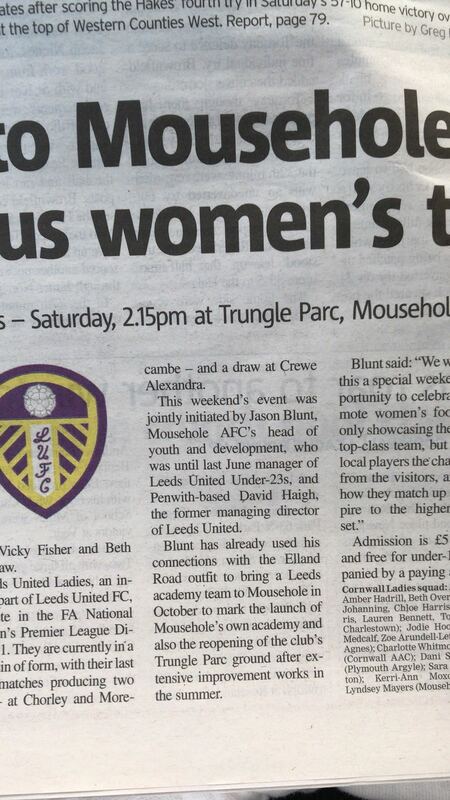 Leeds’ visit to Mousehole is part of a weekend of celebrating women’s football as a whole. As a proud former Chairman of Leeds United Ladies, I have attempted to help put women’s football to the forefront. Leeds United Ladies have gone through a lot of changes in recent years. When I see the team back under the banner and protection of Leeds United, it brings a smile to my face. I hope the team enjoy their weekend in Cornwall, and may it be the first of many. Women’s football has gone through an astonishing upturn in media coverage recently and while it’s long overdue it still needs more of a push. That’s one reason I have recently joined the Cornwall FA Inclusivity Advisory Group. It’s our aim to help make groups of footballers who are on the fringes of media coverage get the limelight and attention they deserve. Football belongs to the people. All people. © 2012-2019 David Haigh, All Rights Reserved.